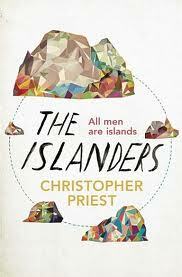 Unlike J. G. Ballard, a novelist who similarly stood astride literary and genre tributaries, Christopher Priest has never quite made it into the mainstream. He has also had some celluloid success with the adaptation of his novel The Prestige a few years ago (and, in one of those strange connections we often find in his fiction, wrote the novelisation of David Cronenberg’s eXistenZ, Cronenberg being the director who filmed Ballard’s Crash). He has, however, perhaps suffered from not having the same exotic biography to draw on. Though both writers have produced intelligent, radical science fiction, their approaches are different: whereas Ballard is like a microscope, focussing on and enlarging one aspect of society in each novel, Priest’s method is kaleidoscopic, presenting many faceted realities which often only seem to coincide with our own at angles. This makes the Dream Archipelago a gift for a writer – and is possibly a dig at that particular genre of world-building fantasy novels that always begins with a map. Though ostensibly a gazetteer, not all the entries are purely informative. As well as the above quoted travel journalism, one chapter contains a series of letters, another documents relating to a suspicious death, and a few read more like short stories. What makes this a novel, however, is the number of reoccurring characters and plot-lines. Most of the recurring characters are artists: the writer Chaster Kammeston, who provides the introduction but whose funeral is described in the text, the artist Dryd Bathurst (whose biography Kammeston writes), the conceptual artist Jordenn Yo who creates networks of tunnels, the writer Moylita Kaine, who corresponds with Kammeston before her own writing career begins (her first novel is entitled The Affirmation, also a Christopher Priest novel). The most important character who isn’t an artist is Elsa Caurer, an intellectual and teacher (and Kammeston’s lover), and also, it seems, the individual to whom The Islanders is dedicated! In this format the reoccurrences can seem increasingly unlikely, but they allow the novel to explore the idea of the artist, though perhaps with tongue at least halfway in cheek. Bathurst debauches from island to island leaving a trail of paintings behind him; Kammeston refuses to leave his island, even for love, because it will damage the mythology of his fiction. (The thryme, as they are called, are quite as terrifying as anything in Alien). There is a love story (Kammeston and Caurer, as mentioned previously), a coming of age story (Kammeston again), a supernatural story (in the chapter ‘Dead Tower’) and a thriller (the story entitled ‘The Drone’). While some of the short, informative chapters can feel like treading water, the longer chapters are often examples of story-telling at its best, and the cross-referencing means that the novel is more than the sum of its parts, with a re-reading undoubtedly needed to fully appreciate it. Priest is a writer we should treasure and acclaim, as those involved in the genre ghetto of science fiction have done for many years. You are currently browsing the archives for the Christopher Priest category.